The EU said its work to help migrants made things better, not worse. It has provided ships, training and funding to the Libyan coastguard. Amnesty says the coastguard is working with criminal gangs and people smugglers who are guilty of a range of abuses, with the knowledge of EU officials. Media captionDetainee Hennessy: "I feel like a dead person"
"Tens of thousands are kept indefinitely in overcrowded detention centres where they are subjected to systematic abuse," said John Dalhuisen, Amnesty's Europe Director. 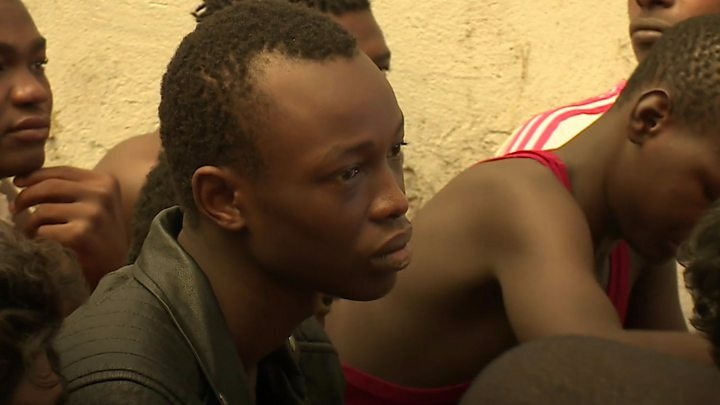 "European governments have not just been fully aware of these abuses; by actively supporting the Libyan authorities in stopping sea crossings and containing people in Libya, they are complicit in these abuses." When a BBC correspondent visited a detention centre earlier this year, detainees described violence and abuse and conditions "like hell" and "even worse than jail". "They beat me with a rubber hose, because they want money to release me. They call the family while beating [you] so the family send money," he said. "The situation is not bad because of the European Union, it is slightly better because of the European Union, " an EU spokesperson said in response to Amnesty's report. "We share the same objective as Amnesty: saving lives. But we would also point out that most of the actions called for are in fact already being carried out." 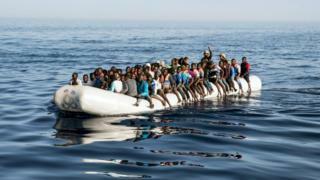 The EU says it has provided funding to the UN's migration agency (IOM) for the voluntary repatriation of some 15,000 migrants to their home countries from Libya.